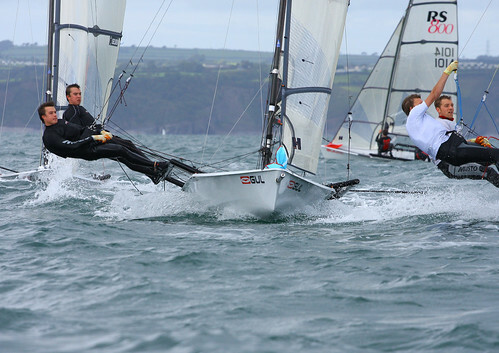 Consistency was key at the Royal Torbay RS800 UK circuit event, as a wide variety of conditions challenged competitor’s brains as well as their boat handling skills. With the RS800 nationals looming ever nearer, this was the final chance of competition for the 12 boats attending, which was evident in the highly competitive start lines and aggressive boat on boat tactics seen all weekend. Day 1 provided varying conditions, blowing 15 to 18 knots with a few 20 knot gusts recorded across the course. Race 1 was dominated by the pairings of Schooling and Kingsworth, Ellway and Bick, and the Visser brothers. Ellway and Bick showed blistering upwind pace, rounding the windward mark 1st in front of the Visser brothers before extending down the run. Meanwhile, Schooling and Kingsworth, rounding further back in the pack, pulled a huge margin back with some superb gust spotting down the run to round second. Up the second beat, Schooling and Kingsworth pulled ahead to round first, with Ellway and Bick rounding several boat lengths back, chased closely by Visser and Visser. Following numerous place changes, the final run saw Schooling and Kingsworth holding a lead over Ellway followed by Visser. Chasing down the final run, the Visser brothers gybed on Ellway and Bick to move into second before heading inland to pick up more pressure. Gybing back, they crossed Schooling and Kingsworth by inches to take the race win. James Date and Toby Wincek took the lead role in race 2, with a race win over Schooling and Kingsworth, and Laurie and Gemma Fitzjohn-Sykes. In the breezier conditions, Date and Wincek drove the boat out right to hook into the breeze shifting off the cliffs, playing the tactics well to take a well deserved win. Race 3 saw the Visser brothers retiring due to illness (unfortunately, not beer related). Sailing home, they witnessed a master class from Schooling and Kingsworth as they sailed to their 1st victory of the event. After a strong start, they crossed the fleet to head inland towards the cliff, tacking back into a strong lift to take a significant lead which they extended throughout the race. Truly an impressive show of boat speed and fleet control, Schooling and Kingsworth never looked challenged. Mike Chapman and Paddy Adams sailed fast and smart to finish 2nd ahead of Ellway and Bick. Day 2 brought partial sun and light breezes to the Torquay coastline. Ross McKerchor and Phil Lasko turned on the class to lead a large proportion of the race, only to be beaten narrowly on the upwind finish (after a shortened course) by the ever speedy Schooling and Kingsworth. The Visser brothers, after having to return to the line following a premature start, sailed back to the lead on the final beat, only to be pipped on the line by Mckerchor and Schooling charging in from the right. The three boats crossed the line within the space of a second, chased closely by the very rapid team of Ellway and Bick. The 5th race (with enough breeze to twin wire in places) saw the most place changes of the entire event, with boats jumping from 1st to mid fleet and back over the space of a single leg. 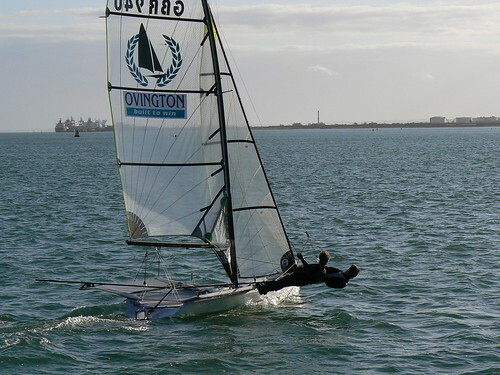 Again, Schooling, Ellway and Visser seemed to have the upper hand as they tacked out left to hook into the stronger breeze on the final beat. Tacking back, the breeze veered right, and continued to go. Stuck furthest left, the Visser brothers lost ground on the long leg to the mark. Schooling, however, managed to get back right just before the big shift came in, and rounded 1st to win the race and to hold onto their commanding lead in the series. James Date and Toby Wincek played the final beat perfectly to finish 2nd and jump up to 4th overall in the standings. With a superb last run, Chapman and Adams gained places to move ahead of Date and Wincek to finish 2nd, and second in the overall standings to leap frog the Visser brothers. Ben Schooling and George Kingsworth sailed a superb series to discard a 2nd place to win the RS800 UK event with 1 race to spare. Although only a relatively small fleet made the journey, competitive sailing and testing conditions made the trip well worthwhile. Special mention must go out to Royal Torbay Yacht club, who put on a highly enjoyable event, and provided perhaps the warmest welcome ever experienced at a sailing event.